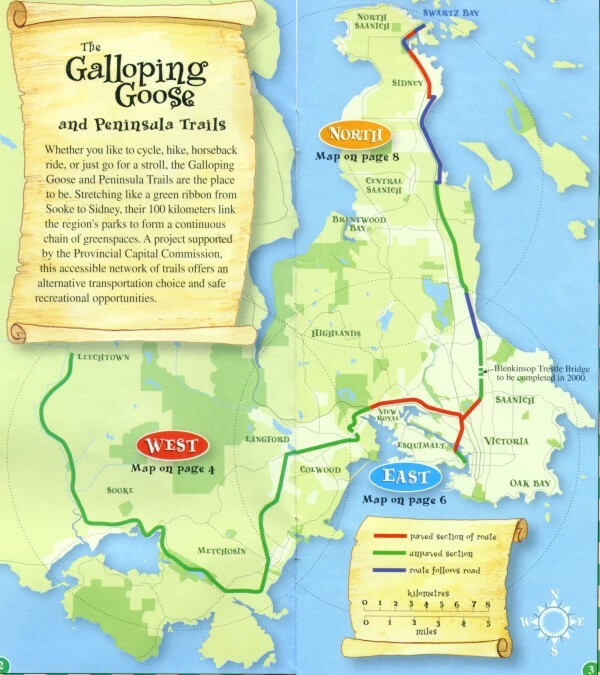 Part of the Trans Canada Trail which will traverse the country by the year 2000, the Galloping Goose and Peninsula Trails form one of the most picturesque trail systems in Canada. Dedicated in 1989, the Galloping Goose Trail is named for a gawky and noisy gas rail-car which carried passengers between Victoria and Sooke in the 1920's. The first rail tracks were laid on Island soil in 1893, with the opening of the Victoria and Sidney line. That was followed by the Vancouver Island section of the Canadian National Railway dedicated in 1911, and by the B.C. Electric in 1913. 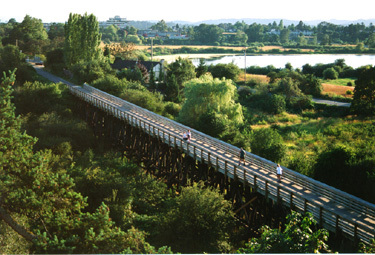 Built upon the abandoned rail beds and trestles of that railway legacy, the Galloping Goose and Peninsula Trails connect our transportation past with our transportation future. 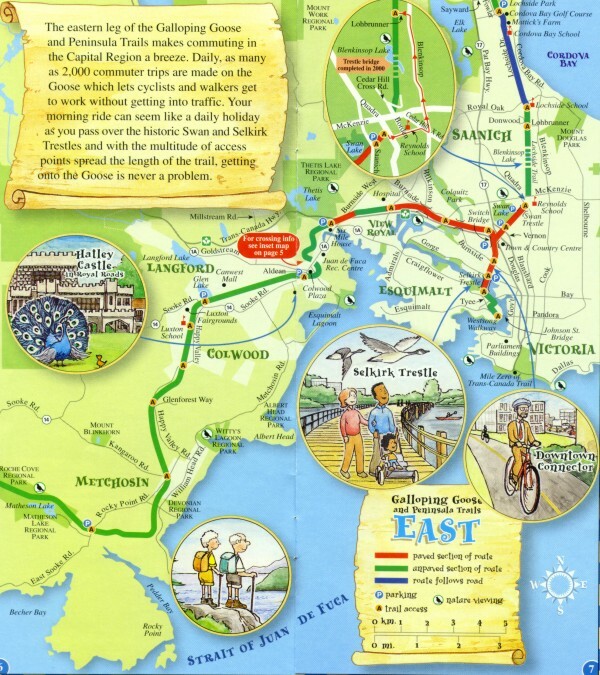 You can travel for nearly 60 kilometres on the Galloping Goose Regional Trail. 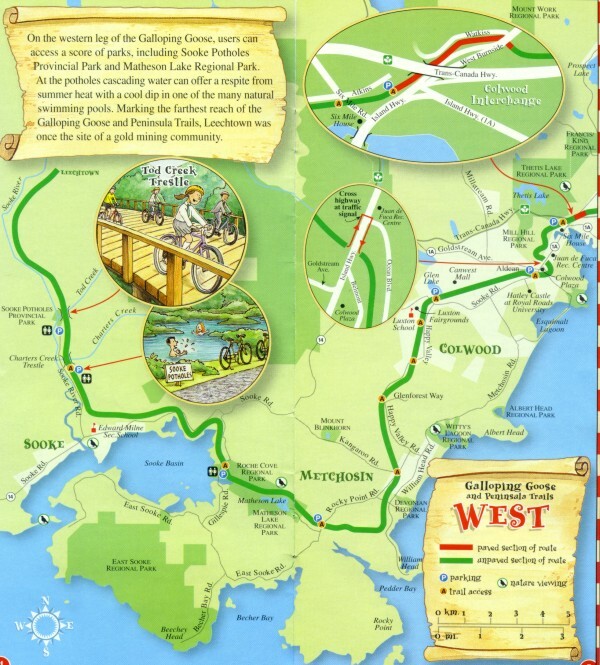 You can cycle, walk, or ride a horse along this former rail line past some of B.C.�s finest scenery. You can spot bald eagles. Or turkey vultures floating on a thermal. You have time to watch a deer in the sword ferns. Ride the Goose on horseback. You and your horse get into a rhythm. 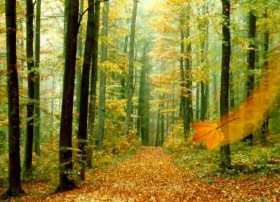 A low Broadleaf Maple brushes your shoulder. You ride past Nootka rose splashed with pastel reds. The scenery flows by in slow motion. A quiet cove. A dark, hidden lake. Rocky outcrops split by twisted Garry Oak. From asphalt to rainforest to canyon... the Goose knows every landscape on Southern Vancouver Island. 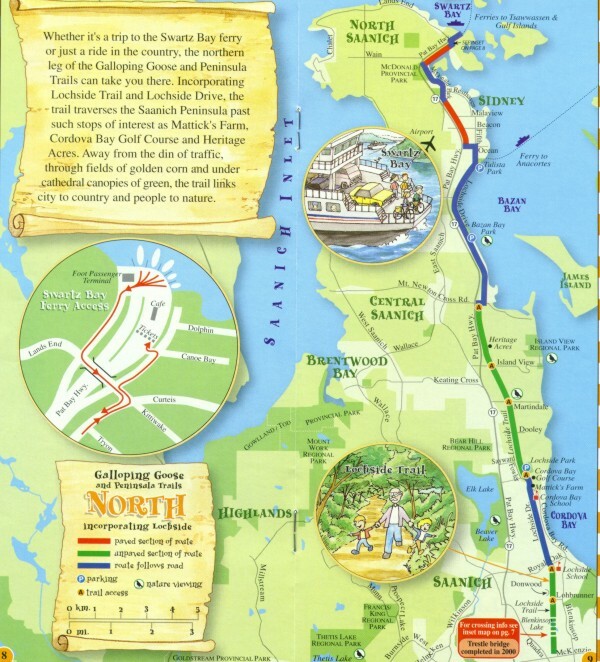 Starting in Victoria, it travels the back roads to Saanich. 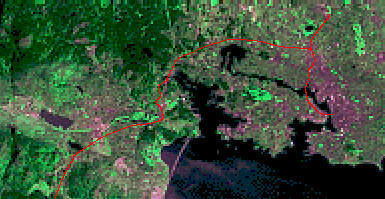 Then it slices through the urban setting of View Royal, Langford, and Colwood. Yet in a delightful surprise, ferns, shrubs, and rock outcrops shield you from much of the concrete. 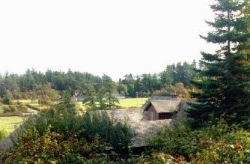 At Metchosin, the trail moves lazily past small farms surrounded by hills. Steep, rocky slopes march down to the trailside. Occasionally the Goose drops into a creek bed. You can stop on the bridge and watch cool water flow over igneous rock. At Matheson Lake Regional Park, you can catch a glimpse of dark water guarded by steep slopes. Watch for bald eagles and ravens. Stop for lunch here, rest a while, and enjoy this peaceful lake. The Goose then enters Roche Cove Regional Park. Coastal Douglas fir and sword fern line the trail. You can use this park as a jumping off point or as an end to a pleasant outing. Toilets and ample parking are just a few kilometres ahead off Gillespie Road. To the west, in Sooke the trail skirts the Sooke Basin, clinging to each headland. Down on the water, you can watch Buffleheads and Barrow�s Goldeneye bobbing on the swell. Across the Basin, the hills of East Sooke Regional Park rise out of the water. This is the Goose at its best. Near the mouth of the Sooke River, the Galloping Goose veers north and climbs out of the coastal plain and up the canyon. Far below, the Sooke River plunges past potholes, back eddies, and hustles out to sea. The original railway tracks once spanned Charters and Todd Creeks. Today only the tall wooden and iron trestles remain. The view from the trail perched on the side of the canyon slopes is spectacular. The Goose steepens ever so slightly on this last section. Finally it levels out at Leechtown, an abandoned mining town. This section of the trail north along the Sooke River is less populated and more wild. Cougars and deer may be part of your Galloping Goose experience. The trail begins at the south end of the Selkirk Trestle, at the foot of Alston Street in Vic West. Access points are found along the entire trail route. Parking areas are located at Atkins Avenue in View Royal, Aldeane Avenue in Colwood, the Luxton Fairgrounds on Sooke Road in Luxton, Rocky Point Road in Metchosin, and Roche Cove Regional Park in East Sooke. 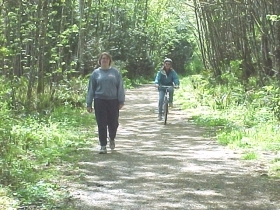 The Galloping Goose Trail moves through urban, rural and wilderness settings; the condition of the trail is often a reflection of its setting. In addition, sections of the trail are under development, or pass through areas of highway construction. We advise trail users to exercise caution and to be prepared for a variety of trail conditions. Cyclists yield to pedestrians, control your speed and warn other users before passing. Remember to bring water and stay hydrated. Keep dogs under control or on a leash and please pick up after your pets. Pass horseback riders with caution, horses may startle easily. At night, all users should carry a light and wear reflective clothing. Do your part to keep the trail clean, don't litter.